We know cars at M & M Auto Detailing LLC. We also know that putting your car in the hands of a stranger can be unsettling, even for auto detailing. We understand. That’s why we strive to ensure you have the best, and your car is handled with care while we provide you with auto detailing services in Hartford. We have the same pride in our business. From 1996, we’ve built a business based on the idea that providing excellent customer service will catapult our business ahead. It’s worked. Our business was grown from owner Mike Fuda’s parents garage to it’s current location in Glastonbury, CT.
We care for your car as much as you do because we are you when it comes to our cars. We take the time to ensure that we cover every aspect of your car with our auto detailing services in Hartford, CT. From bumper to bumper, we seek out dirt, stains, scratches and other removable cosmetic imperfections that compromise the look of your car. Our Hartford Auto Detailing provides you with full-service treatment and a unique customer experience. We know what it takes to get your car prim and proper for the road. We deliver showroom-quality results each time. Our CT Car Detailing Shop has years of experience with auto detailing in Hartford. Whether you need your interior reconditioned, or you just want the Express Detailing and Hand Washing, we are your source for car detailing expertise. Our interior detailers specialize in removing dirt, grime, and stains from every nook and cranny of your vehicle. Our exterior detailers are specially trained in wet sanding, buffing, and vehicle prep in order to remove scratches, paint defects, contamination and imperfections. Our express detailers can provide you with the maintenance you need to keep your vehicle looking showroom in between services. We are the best at what we do, and we want to work for you. 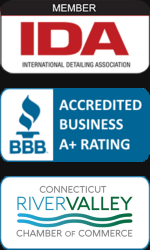 We are a fully licensed, accredited business with years of experience in auto detailing. We stand behind the work we do, ensuring that you are completely satisfied. Our guarantee is a cut above the rest. Our customers are the backbone of the services. We want to make sure that we over deliver when it comes to the services we provide, regardless of what services you are getting. We serve Glastonbury, Connecticut, and the surrounding areas for over 20 years. When you are ready to transform the look of your car, give us a call at (860) 430-1189 or email us at mike@p5c.300.myftpupload.com to set up an appointment.